Giveaway! Handmade Mustache Pillow Home | About Us | Opportunities | Sponsorships | Contact Us! Closed! Winner has been announced! We are so excited about this week’s giveaway here on Handmade Men! It’s the perfect time of year to add comfy decor to your favorite relaxation space – and a great time to select the perfect gift for the man in your life who has it all… and this giveaway makes both happen! We’ve teamed up with Pillow Throw Decor to offer one lucky winner a handmade black-on-gray mustache pillow cover. These pillows are soft, strong, and designed with men in mind! The front of this amazing pillow cover is made from wool felt – the same high quality fabric used in winter coats. The backing is a heavy weight Ralph Lauren upholstery grade linen. 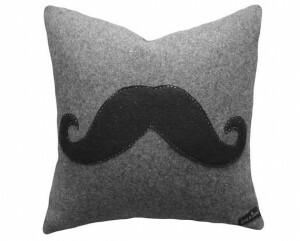 The mustache applique is made from recycled plastic bottles and is soft and comfortable to rest on. This pillow cover is a true work of art and has many loving hours of hard work in each stitch. An 18″x18″ pillow will fit perfectly in this case. You can find them at Ikea, local home decor stores, or online for extremely low cost. Use the easy entry box below to get as many entry points as you can! It takes just a few moments to stock up! Tagged giveaway, Mustache Pillow, Pillow Throw Decor, Rafflecopter. Bookmark the permalink. I would def. be giving this to my fiance as a gift. Great gift! Good Luck, Megan! I would hold it up to my face at least once just to see how I’d look with a PILLOW STACHE!! Otherwise it would reside on my comfy blue loveseat along with my other ecclectic collection of pillows. We’re not having a comment contest, but you win it. This would be perfect for my niece’s dorm room. A great handmade gift! Good luck, Danielle! Oh, I’d keep it and display it proudly on the sofa!! I love it! Handmade is always something to be proud of! Good luck, Rachel! I would add it to the couch. Should make a great addition there. Our guest room needs a little style! Great pillow! I’d add this to my favorite recliner.